All Slots Casino is licensed in Malta by the Maltese Lotteries and Gaming Authority. The casino makes use of Microgaming’s Viper software, which is an exceptionally robust platform that players will love. There are over 500 casino games to choose from and players have the option of downloading the full casino suite or playing in their browser and or on their Mobile devices. All Slots casino recently revised their welcome bonus offer so now the generous guys over at All Slots offer you $1600 free bonus money to get the slots spinning and boy are there tons of slots available at All Slots casino – it really does live up to it’s name. If you want the All Slots no deposit bonus then you could take up their $5 free no deposit bonus to get a feel for the casino. All Slots casino offers a wide variety of online pokies to play online. This casino comes highly recommended by Australian players who have experienced the thrills and wins at their pokie machines. Sign up and play on either desktop or go mobile. Open your casino account and make your 1st deposit, which All Slots will match up to $500 in bonus cash. Keep playing and get up to $500 on your 2nd deposit. Get more time to play with an extra $500 on your 3rd deposit. The welcome bonus amounts are subject to a minimum wagering requirement of at least 50 times before it is transferred to your cash balance. The minimum deposit accepted each time, is $25. In order to receive the maximum possible bonus, a total of $1,500 would need to be deposited within 7 days. Only slots, Keno and scratch card games contribute 100% toward meeting the wagering requirements. These terms may vary at All Slots’ discretion. With All Slots Mobile you will have your own personal pokie machine with you wherever you go. Their mobile pokie selection is growing monthly and there are some top feature games to fill you slots craving. Some of the Aussie favourites that you will find include pokie games like Burning Desire, Break Da Bank Again, Alaskan Fishing and Tomb Raider. You definitely will not come undone playing Pokies at All Slots. Slots players will be spoilt for choice and there are four different categories of slots games to choose from. These include the very best and latest: video slots and classic reel slots. The pokies are fun to play and feature loads of extras like autoplay, bonus rounds, free spins, and jackpots that boast incredible cash prizes. Progressive jackpots are by far one the most favoured casino games on offer and it’s easy to see why. These games form part of the Micorgaming jackpot network and are played by players across many different casinos, where they all contribute to the enormous jackpot. The ever-popular Mega Moolah slot often exceeds a jackpot Total of $3 million and winning this will change your life for forever. All Slots Casino selection is much larger than what you are used to on Aristocrat. New games are constantly being developed and the slots games are superb with 243-way to win titles like Thunderstruck II, Mermaid Millions, Mad Hatters, Hitman and Isis. 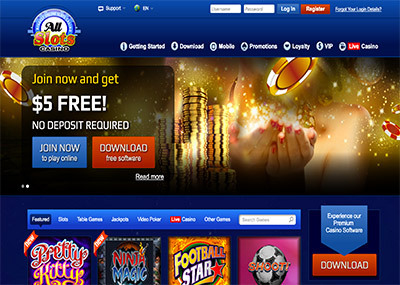 All Slots Online Casino has a large number of deposits and withdrawal options and accepts major credit cards as well as other ewallet options. Australians are encouraged to use web wallets like UKash, Envoy Poli, Neteller and EntroPay, as they are by far the quickest and easiest way to deposit or withdraw money at the casino. TIP: An added benefit is if you deposit using certain web wallets like Ukash, Neteller and EntroPay you will receive an additional 10% cash bonus. Aussies can call a dedicated support team on 1-800-176-991 if and when they need help. Or make use of the live chat option and chat via text with the support staff. Players can rest assured that their information is handled with the strictest confidentiality and the casino uses industry standard encryption to safeguard players’ personal and financial information. The casino is also certified by eCOGRA, and publishes its audited payout percentages every month.